← Bits: Dylan’s Party Edition. Up, Up And 16 Feet High. It all started when I stole some balloons from a child’s birthday party. As I mentioned yesterday, we attended a birthday party in my hometown for my best friend’s son over the weekend. Just before we left, I informed Hillary that I was going to steal some of the balloons she had up as decorations. She had some stapled to her fence, so I tugged on them and the ribbons broke at the staple. So I took them. And left the leftover ribbon just dangling on her fence. 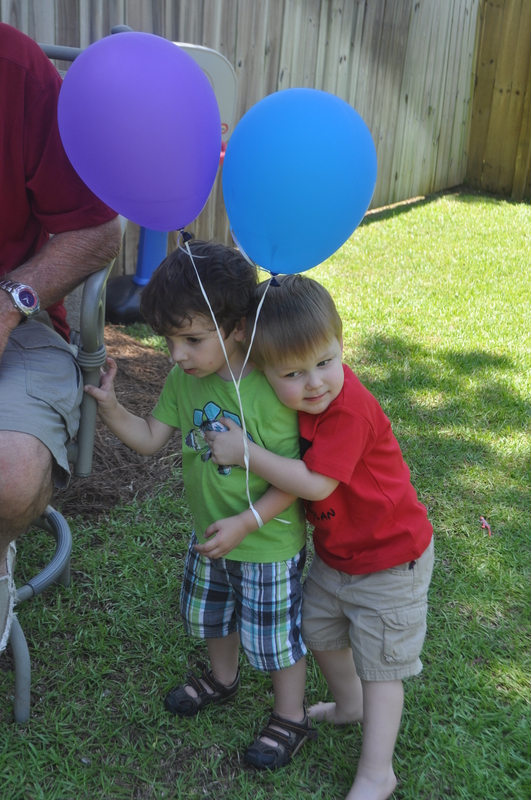 Tom was thrilled with his two balloons and I tied them to his wrist to make sure they didn’t fly away. Then I tried putting him in his carseat and realized it was impossible with balloons tied to his wrist. So I undid the knots and let the balloons roam free in the minivan. My hometown is 2 hours away from our house, so before Tom and I headed back home I planned a quick stop at my parents house even though they were out of town. Because I’m a nursing mama. And my baby wasn’t with me. So I had to pump. We arrived at my parents house and Tom insisted on taking the balloons inside. I took them inside, tied them to a chair, set up a train set for Tom, got him some milk and made sure he was all nice and settled so I could start the quick 10-minutes-tops process. I sat down and about halfway through Tom got up and went over to the balloons. And that’s how two balloons with short strings floated up to the top of my parent’s dining room ceiling. My parent’s house has tall ceilings throughout. The ceiling is 16 feet tall in there. I am not even remotely close to 16 feet tall, so…yeah. I asked Tom what he was thinking (no response) and then set out to find something to help me get them down. First I started to look for a ladder. There was no ladder in either of their garages. I went back inside to search again before remembering another area where they keep outdoor equipment and found one. I lugged the ladder inside. I go back outside to the garage and find one of those things people use to dig holes. The tips of the hole digger only completely meet on the top sides, but I still thought maybe I could grab the ribbon with it. Over and over and over I tried. Do you know how heavy a hole digger thingy is when you’re holding it directly over your head and trying to open it and then close it to catch a floating ribbon just on one certain part of the hole digger thingy?! So I gave up and put it back in the garage and found one of their heavy duty brooms instead. And then I found a roll of packing tape. And then I wrapped the packing tape around the tip of the handle and went back up the ladder. And then I sort of swung the broom with the sticky handle around and around and around and infinity trying to get the ribbon to attach to the tape just long enough for me to grab it. And that took about 20 more minutes or so. My sticky broom handle swinging atop a ladder while yelling, “Stop that, Tom!” worked! It wasn’t at all pretty. It wasn’t at all graceful. It wasn’t at all not filled with some (slight) cursing. I got both of those balloons down. And were immediately put back into the minivan so they could head home with us. You know, I have accomplished some pretty neato things in my life. But in that moment, nothing made me more proud than capturing two stolen balloons with short strings from the top of my parent’s ceiling. On the ride home, another of my best friends called me to tell me he and his wife found out they are having a baby boy. Tom with the birthday boy and the stolen balloons. 3 Responses to Up, Up And 16 Feet High. hehe.. I wish I was a fly on the wall for that one! I had a similar experience but involved a cat, a leash, yard clippers, a ladder and a truck!